I'm not sure what caught my attention more here, the fact that someone made a bacon Kevin Bacon or the fact that the artist's description of the creation process is a bit freaky. After realizing that using soft, cooked bacon would pose a serious "rot factor problem," Lahue opted for bacon bits as his main medium, using seven bottles of bits and glue to meticulously cover every crevice of Bacon's smiling face. "I put five coats of lacquer on top, which sealed everything together. He's not going anywhere," he explains. 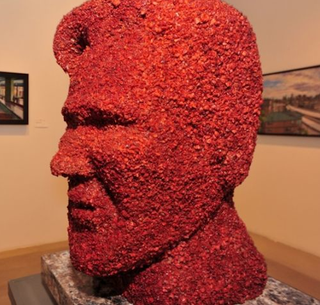 Besides bacon bits continually falling off as he worked on the sculpture over the course of three months, Lahue says another major challenge was his own grumbling stomach. He admits working with bacon all day made him hungry for the crispy stuff, and says he curbed his craving by snacking on bacon bits throughout the project. "I ate one whole bottle of bacon bits myself along the way. I'd put a little on the [sculpture's] head and then keep a little mouthful for me here and there. I had never eaten much bacon before this, but I've eaten a lot since. I'm having subconscious cravings!" Lahue says. The artist is also hankering to see his creation in his refrigerator again, since that's where he stored it between touch-up sessions. "I do miss seeing him in the fridge," he confesses. "I would get up in the middle of the night to get a glass of water and see him there, looking back at me with that grin. I got a little attached, so I hope he goes to a good home."